Huh. Maybe these commercials aren't so fake. It's been announced that, as part of the merchandise for Toy Story 3, they actually will be making a Lots-o'-Huggin' Bear. I don't rent movies as much as I used to. I don't know why. There was a time when I'd run out and rent any movie with a modicum of critical praise to see what cool stuff I was missing. I think the main reason why I don't rent as many movies any more is because I've got this vast library of DVDs now, so it's easier and cheaper to just watch Star Wars again. But, with this new Blu-Ray player, I thought I should break it in by renting a few Blu-Rays. First up, in the spirit of the time when I'd rent movies on an almost weekly basis, I figured it was time to finally check out the winner of the Best Picture Academy Award for 2009, The Hurt Locker. If you haven't seen it now, the film is about Sgt. James, a US Army bomb disposal expert as he disarms bombs in Iraq and battles his own personal demons. I found it to be pretty good. It was tense when it needed to be, provided some moments of dark comedy, and had a couple of good action scenes. And hey, Ralph Fiennes shows up! I enjoyed it, and I think it was deserving of the Best Picture Oscar. Secondly, I rented Whip It, the tender, coming-of-age tale where Ellen Page learns who she is out on the roller derby track. There was a lot about this film that had me curious...mainly, how it was heavily hyped as the directorial debut of Drew Barrymore. Plus, a lot of Saturday Night Live fanboys and fangirls where heralding a breakout performance by Kristin Wiig. There's a lot of good stuff in this film. It looks good. The performances are great. Even Jimmy Fallon, who I usually find more annoying than funny, was actually pretty funny as the announcer of the roller derby games. And it was great to see Daniel Stern again, playing Ellen Page's father. He was so funny, but then he kind of disappeared in the mid-90s, and now he's back, as his good ol', slightly clueless self, who you know would just love to be more supportive of his daughter, if only he weren't slightly afraid of his fierce and fighting wife. And the soundtrack is amazing. Did I mention the soundtrack is amazing? Music that haunts me. My only big complaint is that the plot is a fairly typical coming-of-age story. Gee, will mom actually show up to watch the big game? What do you think? Hardly any surprises in the plot, but it's all just packaged so well you can't help but love it. All in all, I thoroughly enjoyed it. Last up, I fired up the British film Pirate Radio, but I kind of like it's original British title, The Boat that Rocked. They year is 1966, and there was this growing trend in the UK of pirate radio stations. They were based on boats, anchored just off shore in international waters, and broadcast their high-powered signals to the mainland. This the story of one such station, Radio Rock, who specialized in a lot of the rock banned in England at the time. I was curious about it, because they just don't make a lot of movies about radio stations anymore. The closest we have to a main character is Carl, a young man, just kicked out of school, sent by his mother out Radio Rock to get put to work out at the station. While there, he meets the wide assortment of personalities who man the airwaves, and learns about life, the universe and everything. Meanwhile, in a very funny subplot, Kenneth Branagh plays the stodgy old MP given the task of finding a way to shut down these pirate radio stations. There's not much of a plot to this film...more just a series of vignettes with some outlandish radio personalities. That being said, though, I did find it quite funny and found myself laughing out loud quite a bit. Again, I highly recommend it. New week means I've got a new podcast! What's going on in this week's episode of U62: The Targ! This week, I threw together Episode 3.28: Feeling Blu-Ray. I talk about my newly-acquired Blu-Ray player, offer up an early review of Batgirl: Year One, and share some miscellaneous Pixar news. Head here to subscribe in iTunes! So, I finally got my Blu-Ray player. Woo hoo? I've been wanting one for so long, and keeping my eyes on the sales and everything, that you think that finally getting one would be much bigger payoff. But no. There's a different vibe to this...a different energy from when I first purchased my DVD player 9 years ago. Wow, have I really had my DVD player for that long? In my waning days at university, several of my friends had DVD players, and I was instantly in love with them. When I graduated, I was all like, "Dude, I'm going to get me one!" All throughout Y2K, I'd been saving my pennies, carefully tucking them away, and in January of 2001, when the first round of Ralphbucks arrived in the mail, that put me over the top, and I booked a day off work special to go into the city and buy it. Now see, it's funny when it comes to me and buying technology. I'm a man who tries his best to do everything right. I save my money. I do my research. I find models that are well-known for affordability, reliability, and quality. I map out a budget. I wait for my particular model to go on sale, so I can get an even better deal. And then, when the day comes, I walk into the store, all my budgets and research go out the window, and I get the shiny one. That's exactly how it happened when I bought my DVD player nine years ago. I had my eye on this $300 model. However, my friend who came with me that day, talked me into a $400 model that had more bells and whistles. The salesman also helped in making the upsell. However, my friend and I found the salesman to be a colossal douche, so when the salesman's back was turned, we grabbed the DVD player off the shelf, and went up to the tills, so that way the salesman didn't get the commission. With DVD player safely purchased and in my car, my friend and I then hit about three or four video shops in Edmonton, getting my first batch of DVDs. I must have dropped $600 that day, between the DVD player and my first batch of DVDs...roughly twice my budget. And for the next few weeks, it was awesome, as I had friends over to show off my DVD player and we poured through bonus features and just enjoyed the movies. Flash-forward to the present day. That $400 model is now 9 years old. While it was still pretty good, it was starting to do some funny quirks and hiccups and I knew it was on its last legs. So if I was going to buy a new one, I may as well make the upgrade, right? Lot of similarities between buying my Blu-Ray and buying my DVD player. I dutifully saved my pennies for a year. A government cheque put me over the top (Ralphbucks in 2001...tax refund in 2010.) But a lot more differences. I went in alone this time. I did it on a typical weekend...no special day off from work. No high pressure salesman. I had my eye on a $250 model and I was able to stick to my budget and that model. Rather than go all over town looking for a dozen discs, I just grabbed a couple that I was mildly interested in. The whole endeavour cost me $300 in the end. I can't figure out what I'm not as jazzed and excited about Blu-Ray as I was about DVD. Maybe it's because DVDs play on Blu-Ray players, so I've still got this massive library of films...it's not like I'm taking my first step into a larger world. Maybe it's because all my friends were getting them at the time, and our collective excitement made it more exciting. At this point in my life, most of my friends and colleagues really couldn't care less about Blu-Ray and movies and stuff of that nature. Oh, well. I have embraced the next generation. If all goes well, I'll be set for the next 9 years in home entertainment. Now if only I had the flatscreen LCD TV to go with it to fully enjoy hi definition entertainment. I think I know what I'm saving for next year. Even though I saw it a week ago, I finally got around to writing my review of Clash of the Titans. Give it a read, if you please. After months, nay, years, of speculation, Pixar finally made the official announcement yesterday. Monsters Inc. 2 is a go! No word yet on what the plot is, or if any of the original creative team will be back. At the very least, I hope Pete Docter is back on board as director. Docter, of course, last directed Up, which won the Best Animated Film Oscar last year. But we do know a release date: November 2012. Fun Fact about Monsters Inc #1: Bill Murray was the original choice to voice Sully. As is the stuff of urban legend in Hollywood, Murray doesn't have an agent. Instead, he has a special phone with an answering maching hooked up to it that people call to leave their movie offers on. 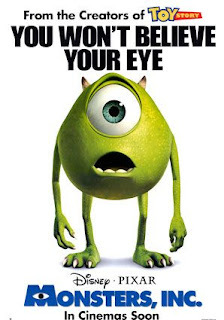 The directors of Monsters Inc met with Murray, Murray seemed interested, and then the directors called that number to officially offer Murray the role. When Murray never returned their calls, the directors took that as a "no." Fun Fact about Monsters Inc #2: Billy Crystal was the original choice to voice...Buzz Lightyear in Toy Story. Crystal turned it down, and has since gone on record many times as calling it the biggest mistake of his career. 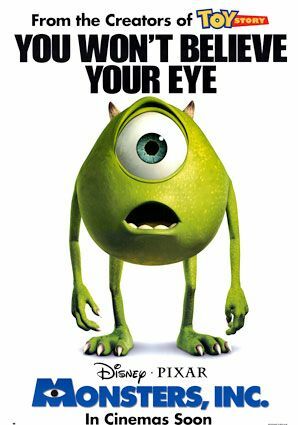 So, when the directors of Monsters Inc called up Crystal to offer him the role of Mike, Crystal dropped everything and said, "Yes." So, there's another new cartoon coming this fall based on a DC Comic title. 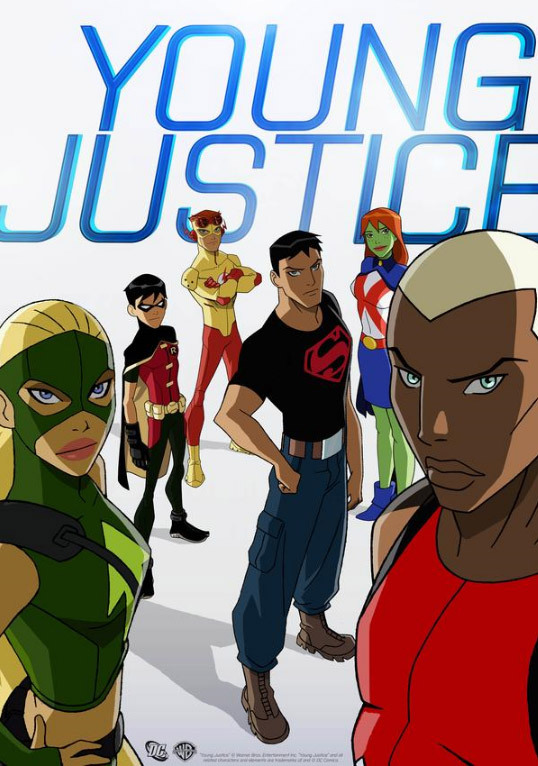 The latest entry in the DC animated pantheon is...Young Justice. Young Justice was a group of teen superheroes that existed in the late-90s/early-00s. It was kind of created to fill the void left by the Teen Titans, because they all grew up and became simply "The Titans." The group was disbanded with the bulk of them being mentored by the Titans to become the new Teen Titans. As you can see, the line-up in our superhero group is Superboy, Robin, Kid Flash, Aqualad (who has arbitrarily been made African American to add racial diversity), Miss Martian, and Artemis, who from what I gather online is based on the current Speedy. The 'toon premieres on the Cartoon Network this fall. Oh, and good news for a super-geek like me, the creator/showrunner is Greg Weisman, who was the creator/showrunner of Disney's cult classic 'toon, Gargoyles. And speaking of DC animation, here's the latest trailer for the next DTV animated film, Batman: Under the Red Hood. It's Sunday morning! As always, I celebrate with a new episode of U62: The Targ! Not gonna lie...kinda phoned it in this week. I hit you with Episode 3.27: Funny Numbers, where I reminisce about the tacky tourist traps of Japan, tell you all about the latest book I read, and take a look ahead to 2010's summer blockbusters. So, my alma matter has been making the news recently. NAIT was recently toying with the notion of canceling 13 programs as part of budget cutbacks. Most controversial of these cuts was ending their captioning & court reporting program. Since the graduates of this program go on to provide captioning services, and it's the only institution in the country that teaches it, that decision raised the ire of a lot of hard-of-hearing advocacy groups. However, it's all moot now, as today NAIT's governing council decided against canceling the programs, and they'll find some other way to make up the money. I kept getting distracted during the coverage, though, because whenever they went to NAIT's president Sam Shaw for a comment, I couldn't help but think, "Hey! I interviewed him once." Yeah, it's true. When I was attending NAIT to get my diploma in broadcasting, I interviewed him for a news story. I was a little bit out of my league, but it was one of those times where I thought, "What they hey?" and just went for it. At the start of my third semester in the program, my news professor was laying down the rules of her class. "Some interviews you get," she said, "Will be of such importance, that I'll have no choice but to give you a high grade. Heck, and interview with the president of the college would probably get you an instant 100%" I made a note of that offhand comment. I made a promise to myself. If my grades were low in news, and I needed something to get them back up, I'd go get an interview with the president. As semester three started drawing to a close, news was one of my better subjects and my grades were never in fear of slipping. When it came time to file my final news stories of the semester, I was stuck for an idea for a story. As I was wandering the halls of NAIT looking for inspiration, I walked by the president's office and though, "Let's do it. Let's interview the president." I entered the president's office, walked up to his receptionist, and pleaded my case. She went into the president's office to see if he wanted to do this. She left the door open, so I heard the president say, "Sure, why not? Sounds like fun!" The receptionist came back out, looked at the president's calendar, and said to me, "Will tomorrow at 2 be OK?" Next day at 2, I showed up at the president's office with my recording equipment. I was escorted into his office, I sat down, we shared pleasantries, and then I fired up the tape recorder and went to work. We spent about 15 minutes talking about life, the universe, and everything. NAIT's always had overcrowded parking lots, so I asked about the parking problems and what he was doing to fix them. We'd also just been through a provincial election, so I got his reaction to the election and what it would mean for post-secondary education. There was one thing that came out of the election that caught my eye and was eager to get his opinion on. Back in the late-1990s, during another round of government restructuring, Ralph Klein did something very controversial in education circles. He decided to take the department of education and the department of post-secondary eduction and amalgamate them into one super-department: the department of learning. School boards and post-secondary governing councils were aghast at this concept, citing that while it might look logical on paper, the two forms of education were actually vastly different and one person could not look after it all. So, then, after the 2004 election, buried in the back pages, was that Klein had decided to split the department of learning in two, and once again, there was a department of education and department of post-secondary education. So, of course, I had to ask the president how things would be different now that post-secondary education once again had their own individual voice in cabinet. He said it was a very, very, very good thing, and that post-secondary institutions would no longer have to compete with elementary schools and high schools for funding. I got about three good news stories out of that interview, and as my professor stated at the start of the year, got 100% on it. Just one of those fun, silly things where it was worth it to go for it. A couple of interesting movie news tidbits came across my desk today. Seth MacFarlane, creator of Family Guy, American Dad and The Cleveland Show, is looking to make his big screen directorial debut. The script is called Ted, and was written by MacFarlane and two of his fellow Family Guy writers, Alec Sulkin and Wellsley Wild. The script is about a guy who, when he was kid, makes a wish that his teddy bear were alive and his best friend. And, cuz it's a movie, the wish comes true. The guy and his teddy bear grow up to the best of friends. And then, the man meets the woman of his dreams. But, she finds this guy's relationship with his teddy bear to be weird, and issues an ultimatum: it's her or the teddy bear. Can this lifelong friendship be severed? MacFarlane is in negotiations with Universal Pictures to produce the film. MacFarlane, in addition to writing and directing, would also do the voice of the teddy bear. No word yet on casting, but rumor has it MacFarlane wants his old friend Mila Kunis, who does the voice of Meg on Family Guy to play the girlfriend. Now this bit of movie news is really interesting. Hollywood is so desperate to turn comic books into movies, that they're looking for unproduced comics! Jack Kirby. A legendary comic book artist. Working for Marvel comics, he co-created Captain America, the Hulk, the Fantastic Four, the X-Men, the Silver Surfer, and countless others. In the 1970s, he went to DC, where he created the entire New Gods saga. 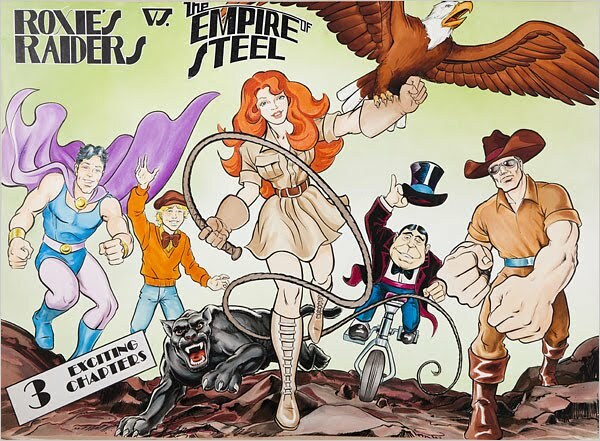 In the late 1970s/early 1980s, he grew tired of comics and went out to Hollywood to try his hand at animation. He worked on such classic 'toons as Super Friends and Thundarr the Barbarian. While working for the animation studio Ruby-Spears Productions, Kirby created several proposals for cartoons. While these proposals blew away the management at Ruby-Spears, none of them were ever produced, and were filed away, lost to the ages. Until today. These unused Kirby proposals were recently sold to the legendary TV producers Sid & Marty Krofft, who gave us such classic shows as Land of the Lost and H.R. Puffnstuff. The Kroffts tend to develop these Kirby proposals into full-blown media franchises. Roxy's Raiders - Described as a "female Indiana Jones," as she travels the world with her fellow treasure hunters as they go evil-fighting and tomb-raiding. The Golden Shield - A superpowered Mayan warrior battles the forces that strive to bring about the end of the world in 2012. The Gargoids - A group of scientists gain superpowers after being exposed to an alien virus. Some of these sound really good. I hope something good comes from them. And we're back from having taken Easter off! We're here with an all-new episode of U62: The Targ! I think this one was worth the wait. It's one of those ones where everything was clicking as I produced it. Episode 3.26: Spellbound analyzes the growing mainstream coverage of pornographic parodies, geeks out over the Batman: The Brave and the Bold episode Chill of the Night!, and tries to answer the question that many a school child has asked, "What the hell is the point of the 12 minute run?" I just finished watching the Batman: The Brave and the Bold episode Chill of the Night!, and I must say, that's got to be one of the best episodes of that cartoon to date. Granted, I like it because it's got gobs and gobs of fanservice going for it. But, added to that, is the fact that it is a very good story. And for a cartoon that's prided itself on being a more lighthearted take on the Batman mythos, it is shocking how dark of an episode it is. It's one of those episodes that goes deep into Batman's origins and tries to figure out what makes him tick. Those always make for good episodes of any Batman cartoon, as Batman has a very grim origin with lots of dark alleys to explore. So, the plot. In an otherworldly nexus, two of DC's supernatural heroes, the Spectre and the Phantom Stranger, are having a discussion. The Phantom Stranger applauds Batman for always being on the side of justice, but the Spectre is upset that Batman hasn't become an agent of vengeance who dispatches the guilty in grizzly manner. So, the Spectre and the Phantom Stranger essentially make a wager for Batman's soul. Should the Spectre win, Batman becomes a murderous agent of vengeance. Should the Phantom Stranger win, Batman continues on his path as an agent of justice. So what case is Batman working that brought the Spectre and the Phantom Stranger together to have this discussion? Batman is very close to solving the case that created him: finding the murder of Thomas and Martha Wayne. That's right, Bruce Wayne is finally about to track down the man who killed his parents. Once Batman finds this man, will he become an agent of vengeance and murder his parents killer, or remain an agent of justice and turn him in to the proper authorities? As I'm sure you can imagine, Phantom Stranger and Spectre show up to assist Batman in this case, and they very much play the roles of the angel and the devil on Batman's shoulders. And there's also a great sequence where Phantom Stranger throws Batman back in time, and Batman actually gets to meet his parents and fight along side his father...who's also dressed as a bat, thanks to comic book contrivances. Now, I mentioned the great gobs of fanservice in this, so let's look at that. First up, the episode was written by Paul Dini. Dini was one of the main creative forces behind Batman: The Animated Series all those years ago and is still pretty much acknowledged as being one of the greatest writers to write Batman in the past 20 years. And let's not forget the stunt casting! Here's our galaxy of guest stars. Phantom Stranger is voiced by Kevin Conroy, who voiced Batman on Batman: The Animated Series. Spectre is voiced by Mark Hamill, who voiced the Joker on Batman: The Animated Series. Oh, and of course, he was Luke Skywalker, too. When Batman is thrown back in time, Thomas Wayne is voiced by Adam West. You know, Batman on the 1960s TV show. And Martha Wayne is voiced by Julie Newmar, who was Catwoman on the 1960s TV show. And another that wasn't hyped, but I picked up on. Moxon, the mafioso who ordered the death of Thomas Wayne, was voiced by Richard Moll. Still best remembered as Bull on Night Court, Moll also voiced Two-Face on Batman: The Animated Series. But yeah. It was just a great episode, and I can't stop watching it. Now, here's a neat bit of movie news that came across my desk today. Henry Selick is returning to Disney! Selick, of course, is the stop-motion animation guru who gave us the modern-day classics The Nightmare Before Christmas and Coraline. I say he returns to Disney because, dude, Disney made Nightmare and James and the Giant Peach before cutting Selick loose. After Disney cut Selick loose, he was kind of freelance for a while before he found a home at LAIKA, which made Coraline. And then, for reasons I never really figured out, Selick and LAIKA parted company back in the fall. And Disney got him back. Hooray! Here's the kicker though...Selick's films are going to be made under the Pixar label! Pixar's getting into stop-motion animation...awesome. Here's hoping the first thing that they put Selick to work on is Tim Burton's stop-motion animated remake of Frankenweenie. It'll be nice to see a Burton/Selick collaboration again. Oh, and speaking of Pixar, I've had this kicking around for a while now and wanted to share. 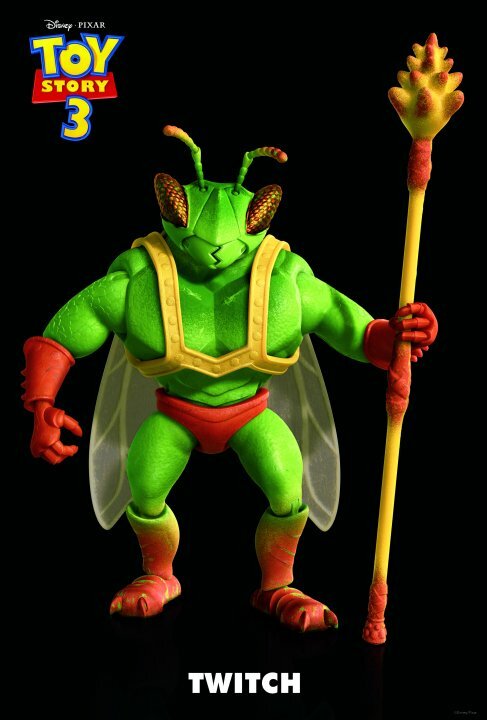 Pixar has been unveiling all these character posters for the new characters in Toy Story 3, and I love this guy who goes by the name of Twitch. He is very obviously inspired by the designs of the old Masters of the Universe figures. Back in my childhood, I would have definitely wanted this guy alongside Mekaneck and Man-E-Faces.